Oaks session at Churchill Downs Monday morning. becoming a professional jockey after watching the Derby on television. to see him every day regardless of whether he’s scheduled to exercise him. pony rider’s reach each time she stretched out to grab his halter. Nick Zito in 2005 and D. Wayne Lukas in 1996.
surface as they continued their preparations for the 10-furlong Derby. rider has been named for Charming Kitten yet. “We’ve got somebody in mind, but it isn’t official yet,” Pletcher said. Revolutionary — walked the shedrow. Another), a feat accomplished only six times before. newcomer to Churchill. He won five races here during the fall meet in 2004.
in the Run for the Roses. exercise rider Peter Shelton at 7 a.m. Monday at Churchill Downs. surface really well — that’s what I liked the most about it,” Shelton said. “He has tactical speed and a big kick when you ask him,” Shelton said. Shelton said Itsmyluckyday makes his job easy. holds the bit enough so you can keep a perfect balance with your body,” he said. Elvis Trujillo has the mount aboard Itsmyluckyday. breezing five furlongs in :59. Brown, 35, is all business as he prepares to saddle his first Derby starter. opening his own stable in 2007. “I’ve been here before. I’m excited, but I keep an even keel,” Brown said. new surroundings in Barn 4.
period reserved for Derby and Oaks horses. “He’s doing pretty much the same thing that we do back home,” Rodriguez said. in his fifth start, the Wood Memorial at Aqueduct. track for a light jog shortly before 6 a.m.
juvenile. Four of those came against stakes company. his races. It took him a long time to catch on and understand racing. admire the Spiral Stakes winner as he grazes behind Barn 41 each morning. The Spiral was March 23, six weeks out from Saturday’s Kentucky Derby. 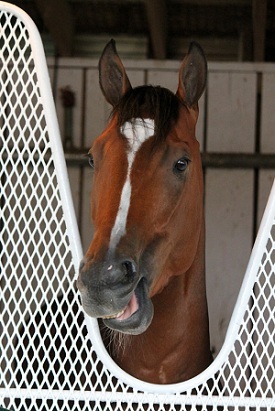 likely will school the son of Lion Heart in the paddock this week. the pace in the Arkansas Derby last time out.